So....this outstanding young man is graduating from high school and his extraordinarily proud grandparents will be there (that would be Steve and I). It seems only yesterday he was a shy, little bundle of energy - bravely trying every new thing that came along while at the same time never wanting to be too far from Mom, Dad and the security of home. We held our collective breaths as he raced around on dirt bikes and rocketed over jumps at the skate board park. When he was nine, some wise person put a a pair of drumsticks in his hands, and he absolutely blossomed. It was readily apparent that a God-given gift had been unearthed. It has been a joy to watch the gift put down roots in his heart and become an offering back to the One who placed it there. His deepest desire is to serve the Lord with his music. Okay - I'm going to stop now, wipe away the tears and look forward to celebrating this wonderful ending/beginning. I'll be taking a little break and hope to come back refreshed. I've been just a tad weary of late. Life can get that way sometimes. Oh, Linda - how wonderful. How proud you are, and justifiably so. Congratulations to your grandson!! 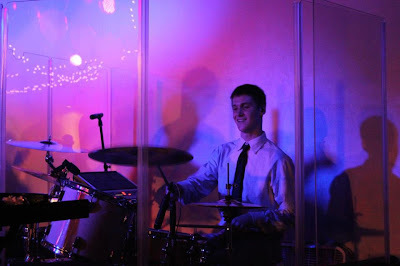 What a handsome grandson you have, Linda...and what joy to see him use his gifts to serve the Lord. Life does get weary - praying for your refreshment, beautiful friend. Don't stay away too long - I'll miss you so. What a blessing to have a godly grandson. Prayers as you take a break. We'll miss you. Congratulations, Linda on your wonderful "drummer boy". What a proud day ... And proud accomplishment! Wishing you a celebration filled with much joy! It is so nice to stop by and visit friends in Blogland. "He gently pries my fingers open and places His hand in mine. I follow Him into this week. Love these and will write them down and take them with me to school tomorrow! ... you are such an encouragement. Over the years, I have found such encouragement through your words. I am going after the joy of mom in my life. And I could use your gift. To share your wisdom, encouragement, and joy of mom. So, I am trying something new. Posting on my lil' blog about mom. Momma notes. Would you consider joining me and sharing a post from your blog. It doesn't have to be a new post. There are so many on your blog I could choose. Simple mom words. Monday I will have a linky thingie. My hope is that we can be encouraged and encourage other moms.